Profuse sweating can lead to embarrassing pit stains and discomfort, sure. But you are sweating sweat. This Italian patient sweats blood. The 21-year-old patient entered a medical ward following three years of bleeding from her palms and face. She didn’t have any cuts and nothing seemed to cause or trigger her bleeding episodes. Her condition was so bad that she’d isolated herself and developed symptoms consistent with depression and panic disorder. After observing the patient and treating her for her depression and anxiety, the Florentine doctors diagnosed the patient with “hematohidrosis,” the rare condition of “blood sweat.” But even to this day, doctors don’t know what causes the condition—and some are skeptical as to its existence. An analysis of the patient’s skin turned up nothing abnormal, as the researchers reported in the Canadian Medical Association Journal. There’s a long history of blood sweat diagnoses, according to a CMAJ commentary. Mention of blood sweat occurs as far back as Aristotle in the third century, B.C., and throughout the Middle Ages. The condition has religious undertones given its association with a religious relic called the Veil of Veronica, a cloth imprinted with Jesus’ face. Still, the commentary continues, a 2012 dermatology textbook said the disorder “has not been confirmed scientifically,” though the authors of that text didn’t deny its existence. The author of the commentary, medical historian Jacalyn Duffin from Queen’s University in Ontario, reviewed 42 medical articles on the condition since 1880. She noticed that almost half of those articles were from the last five years, yet many still doubt the condition’s existence. 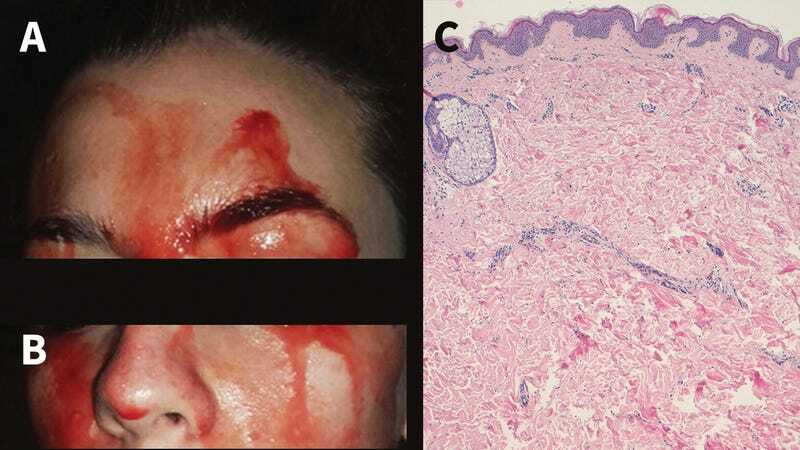 “Ironically, for an increasingly secular world, the long-standing association of hematohidrosis with religious mystery may make its existence harder to accept,” she wrote. The Italian scientists ultimately opted to treat their patient with a beta blocker (and proposed moral enhancer) called propranolol, since others had treated patients similarly in the past. This worked, but it didn’t stop the bleeding completely. On days like this I consider myself very lucky. Can a Pill Make You More Moral? Racism-Curing Pills Are Apparently a Thing Now?